Easter has become such a special holiday in our house! We love the excitement of the Easter Bunny, matching spring dresses and fun egg hunts. With Easter only a few days away, I’m so excited to share an updated Easter Book list. 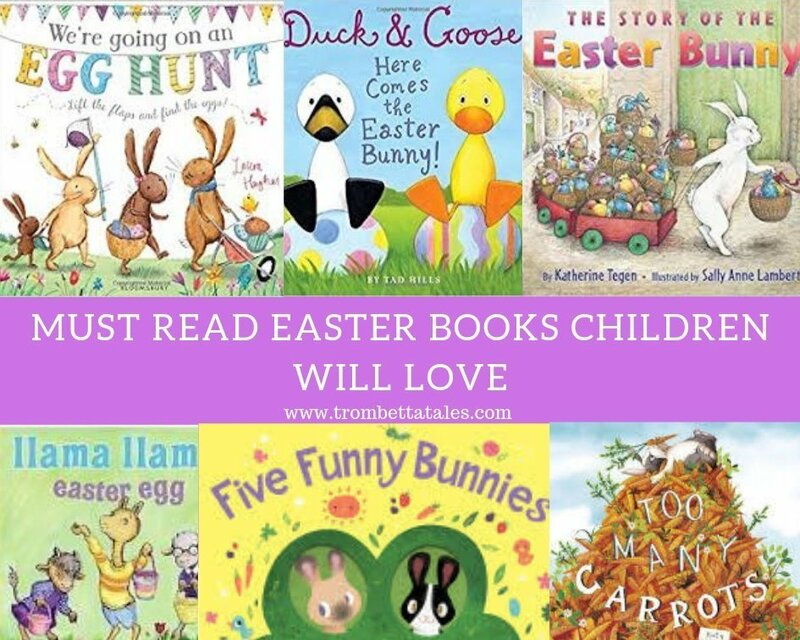 The books on this list range from books that celebrate the Easter Bunny and egg hunts to books with a more religious aspect that teach about the true meaning of Easter. A must-have for your Easter basket, especially if you’re a Beatrix Potter fan and love Peter Rabbit. This sweet book follows Peter Rabbit as he hops along the bunny trail to share an Easter surprise with his friends. It also includes some of Beatrix Potter’s most famous characters such as the Pied Piper and Puddle Duck. The sweetest finger puppet book for young children to read with a parent. This cute story shares with children what they can do in their parents arms such as rocking them to sleep and showing them how to do new things. An extra sweet addition to first Easter basket! A joyful, rhyming peek-a-boo book that features five bunnies hopping through sweet spring scenes. Young children will delight in counting each bunny and the repetitive nature of each page. A sweet book for Easter baskets. Inspired by the popular toddler song The Itsy Bitsy Spider, this book will quickly become a favorite. It has a playful twist on the original song, as a little bunny hops as fast as he can to hide all of his Easter eggs in time for the big day. If you love the Llama Llama series, this short rhyming book is a great addition to your Easter collection. The Illustrations are bold and incorporate favorite Llama Llama characters that follow a simple storyline of finding special treats ( jelly beans, colorful eggs etc.) left for Llama Llama by the Easter Bunny! From the popular Duck and Goose series, this hilarious book follows Ducks and Goose as they try to find the Easter Bunny. Simple language that toddlers can recite and bold illustrations make this a fun book for Easter baskets! Our new favorite Easter book, but it’s really a book that can be read year round. It’s a hilarious tale about a rabbit who loves carrots so much, that they push him out of his burrow. With the help of his animal friends, he learns the value of sharing, but also the importance of true friendship. Yoga Bunny is the perfect book to add to your Easter basket! The story teaches the importance of using yoga to calm down as readers are introduced to basic yoga poses. Illustrations of Bunny demonstrating how calming yoga can be show young readers the importance of mindfulness and slowing down. A perfect tale for Easter about a bunny (PJ) who wants to be anything other than a bunny. On his journey, he decides to try and be a bear, pig and possum, but eventually decides that being a bunny is pretty great. With the repetitious language, children will enjoy guessing which animal PJ will try to be on each page. Based on the same rhythmic pattern from the original “We’re Going on a Bear Hunt“, toddlers will follow a family of bunnies to find 10 eggs to fill their Easter baskets. Along the way, the bunnies encounter all sorts of obstacles ( bees, wolf, ducks etc.) before making it safely home for Easter lunch. The perfect book for toddlers obsessed with “We’re Going on a Bear Hunt“! A heartfelt story about the origin of the Easter Bunny that is perfect for story time! It begins with a couple that weaves baskets, paints eggs, makes candy and delivers Easter treats to the local children each year. As the couple gets older, their bunny skillfully takes over their Easter operation. Accompanied by colorful pastel illustrations, young readers will love reading this book in the weeks leading to Easter. A delightful and humorous book for all ages. Peep is a chick that really wants his friend Egg to hatch, but Egg is fearful to hatch and join the outside world. In an effort to get Egg to hatch, Peep tells him all of the fun things they can do together. It’s colorful and lively illustrations also truly capture the message of facing fears. Perfect for Easter, this book follows a family of chickens as they prepare for a country fair. Whimsical illustrations, and simple rhyming make this a perfect book to reinforce counting skills, and entertain toddlers for hours of Easter reading fun! A classic tale about a mama bunny who dreams of becoming an Easter bunny, and in the end is rewarded for her compassion, kindness and bravery. Embark on a whimsical adventure that takes readers on a journey through a bunnies dreams! The perfect Easter bedtime story, imaginations will soar as young children visualize bunnies finding a crunchy carrot or reciting the ABC’s in an enchanting dream world. A celebration of the meaning of Easter and establishes a family tradition. The Easter Story Egg Book starts on Palm Sunday and ends on Easter. It includes a set of nesting eggs and each egg has a corresponding story in the book for everyday of Holy Week. If you’re looking for a book to explain the true meaning of Easter, this book hits the spot. It focuses on a little polar bear asking her papa questions about God’s plan for Easter. To answer his young cub’s questions, her father lovingly takes her on a walk through the Arctic to explain how Easter came to be. Beautiful illustrations and simple language make this book relatable to young audiences. What are some of your favorite Easter books? I’d love to add a few more to the list! As always, don’t forget to pin the image below and to follow along our book adventure on Instagram! Disclaimer: This post contains affiliate links at no cost to the reader. All opinions are my own. Previous Post Will Your Child Actually Benefit from Reading with Stuffed Animals? So many great recommendations! Just what I was needing. Thanks!! Hi Kristi! 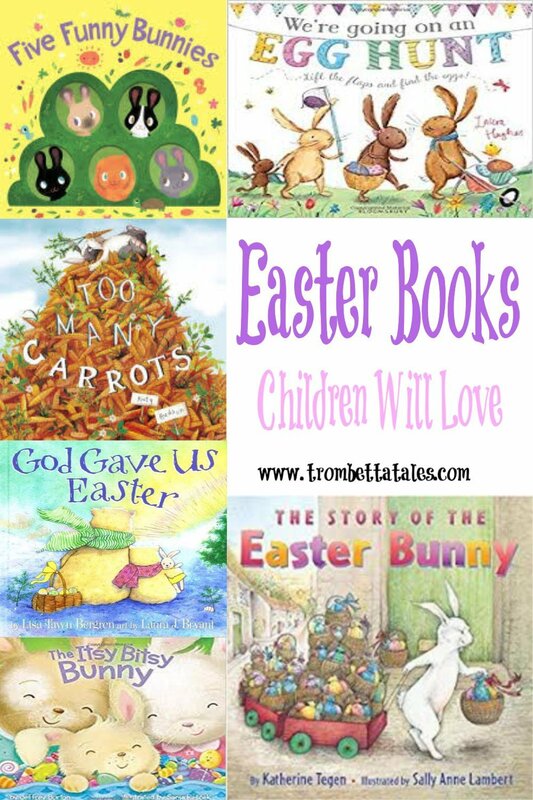 I’m so glad that you loved my latest post for Easter books! I hope that you found a few titles to fill your Easter baskets!